Larger circuses like Barnum and Bailey's would announce their arrival in town with a circus parade. 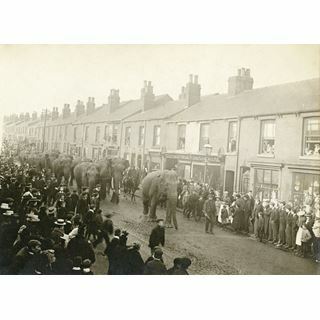 The parade was a natural advertisement for the circus and would attract huge crowds. Bailey began a partnership with P.T. Barnum in 1888 and the 2 Americans formed the famous Barnum and Bailey Circus. Although Barnum died in 1891 the circus retained his name. When Barnum's came to London's Olympia in 1889 they travelled with 450 performers, 300 horses, 21 elephants, 32 cages and 35 parade and baggage wagons. Unfortunately the London authorities would not allow them on the streets. Seven years later when Barnum and Bailey did an extensive British tour, parades were held almost everywhere with a one to three mile procession. Barnum and Bailey's Circus toured Britain from December 1897 until November 1898, then touring the rest of Europe. The show returned to Britain for another run lasting from April to November 1899. During the two tours of Britain the show wintered in London. The show remained in Europe until the end of the 1902 season and then returned to the U.S.A. James Bailey died in 1906 at Mount Vernon, New York. In 1907 his circus interests were sold to Ringlings. Barnum and Bailey's tours were organised like a huge military operation and the circus swept through the country, staying only one or two days at each location. The shows - two per day - were no sooner over than the whole operation was mobilised again - the tents were pulled down while the artistes ate their supper. The entire show was transported by road to the nearest railway goods yard and the trains made their way to the next town. By the time the artistes were taken to the new ground the canteen tent was producing breakfasts and the grooms were at work in the stable-tents preparing the animals for the next shows. 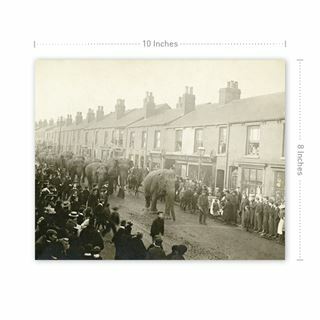 It wasn't just a matter of moving over eight hundred people and the circus equipment - the menagerie was larger than anything seen in Britain before or since. 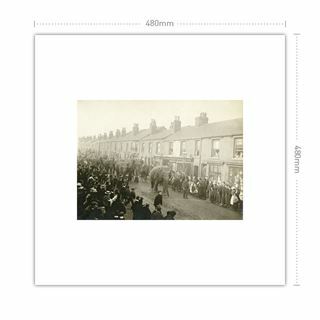 Travelling with Barnum and Bailey's show were four hundred horses, twenty elephants (seen here), camels, zebras, lions, Johanna the Giant Gorilla, five band wagons, a steam engine, and 'thousands of tons of curious creatures and creations'. 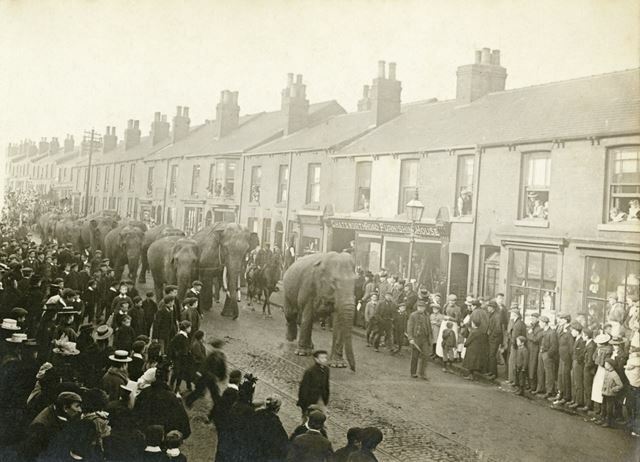 The parade itself was usually nearly a mile in length and took twenty minutes to pass one spot (the parade shown here only consists of elephants, which supports the idea that the show was at Sheffield and not Chesterfield as it would have been impossible to have got the usually larger parade back to the Big Top in time). 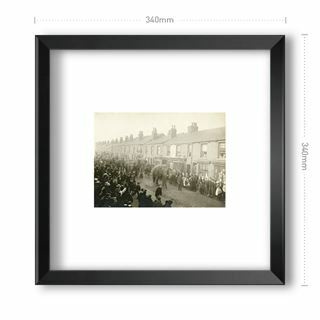 Once back at the circus site the animals and staff had to be ready to open the doors to the public by 12.30.pm. Although the first show of the day did not start until 2.00 pm there was plenty to see before the show began so visitors were advised to come early. Not only were the animals ready to be inspected but there was a huge number of human 'freaks' to be seen as well - giants, midgets, bearded ladies, dog-faced boys, living skeletons etc. - armless wonders, fire and sword swallowers, jugglers, whirling Dervishes and two Sudanese ladies in exotic costume. There were no inhibitions about what was 'politically correct' and the public were blatantly asked to exercise their curiosity. No complaints were made. And nobody on the circus complained of exploitation. In fact the opposite was the case as the freaks explained to the local paper that they enjoyed a eight hour day, good food and all the support services of their travelling organisation. As soon as the second show started at 8 pm their day was over and they became the advance guard making their way back to the trains. The show itself was presented in the style adopted by American circuses - in other words the show was presented in three rings and two stages simultaneously, interspersed with equestrian acts that took over the entire performing space. One of these used seventy horses appearing at the same time and another took the form of races - including races between horses and whippets! The show lasted an hour and a half but of course visitors could spend an additional hour looking round the menagerie and freak show before the circus show and, in addition, could spend some time afterwards in the main tent where a 'Grand Vaudeville Entertainment' was presented for those willing to part with another sixpence! The people of Chesterfield had been notified of Barnum & Bailey's impending visit to Sheffield for some time and the advance billers had flooded the town with brightly coloured posters and had left small handbills in local shops. Tickets were sold in advance and cost between 4/- (20p) and 7/6d (37p). Cheaper tickets were available on the day - the cheapest seat being 1/- (5p). These prices were high compared to other admission prices at local theatres or travelling shows but the scale of the show provided had to be taken into account. Barnum & Bailey's Show claimed to be spending £1500 per day in running costs and informed patrons that the equipment used reflected an £800,000 investment.